Solar Eclipse - is this phenomenon unique to planet Earth? A solar eclipse is a wonderful phenomenon to observe and dedicated people travel the world to be in the right place when one occurs. 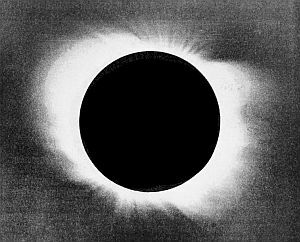 Even if we've not seen a total eclipse with our own eyes, no doubt we've all seen one in newsreel footage and it is truly remarkable. However, have you ever stopped to ponder just what an unbelievable coincidence it is, that the apparent diameters of the Sun and the Moon are identical, when viewed from Earth - thus making this phenomenon possible? As both the Earth's orbit around the Sun and the Moon's orbit around the Earth are elliptical, the relative sizes of these two bodies can vary slightly, as can be seen in the above diagram. Every one-two years, the sizes coincide (as in images one and three) and around 1% of the Earth's surface then experiences a total eclipse. I cannot stress enough how remarkable this is. If our Moon were a lot smaller, it wouldn't be anything like the amazing sight we experience every two years or so. In fact, it would have the appearance of the diagram on the right, which, while quite a sight, isn't anything like as impressive. I cannot stress enough how remarkable this is. If our Moon were a lot smaller, it wouldn't be anything like the amazing sight we experience every two years or so. In fact, it would have the appearance of the diagram here, which, while quite a sight, isn't anything like as impressive. Similarly, if the apparent size of the Moon were bigger than the Sun, then it would obliterate our star completely, plunging Earth into total darkness. The beauty of the apparent exact match is that it reveals the Sun's magnificent corona in all its glory. Only observable for several minutes, it has been described as one of the most awe inspiring sights in nature. When the Sun is at it apparent largest and the Moon at its smallest, the Sun is not completely eclipsed and this type is known as "annular", as this graphic shows. When the Moon was first formed, it was much closer to Earth - it's been estimated at between 12,000 and 18,000 miles distant, as opposed to 238,600 today. It would have totally covered the Sun and then some. Since its formation, the Moon has been gradually moving away from the Earth and continues to do so. Between now and 1.4 billion years in the future, the Moon will become 14,600 miles further away from Earth. Eventually it will become too small for any solar eclipses to take place. We are on this planet at just the right time! This phenomenon is certainly unique in our solar system. Mercury and Venus don't possess any moons, the two orbiting Mars are far too tiny, those around the gas and liquid giants, Jupiter, Saturn, Uranus and Nepture, while pretty huge, are easily dwarfed by their host planet. Elsewhere in the Universe, amongst the various other solar systems that have been discovered, it is possible, I suppose, for one particular planet/moon system to have this precise geometry, but the thing is, it has to be exact. There's a good chance that the Earth/Moon/Sun system is unique and we inhabitants of Earth are privileged enough to be around to see it.